Bride & Groom, Bridesmaid and Groomsmaid will be taken by limousine from airport to the hotel. A Photographer and videographer will shoots while they are taken from airport and bringing to the Hotel. Than these records will be used to Marriage Story Clip. Welcome Cocktail at Green area of the Hotel. Military Band show with live music. Bride and Groom will be taken to the venu by Sultanate yacht from the sea. Venue will be prepared for Mehndi Ceremony. Stairs of the place will be set up as an entrance walkway and 20 marble vases will designed with Flowers which be in pink and fuchsia colors. A Special platform will be set for Bride & Groom. Gazebo (Mandap) will set at platform in fuchsia and pink Colour. 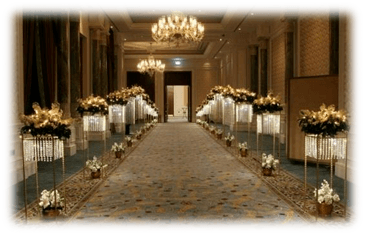 Place for Bride & Groom will decorated by chiffon and fresh flowers. Two Indian thematic armchair will set for Bride & Groom. Carpets and matresses will lay to ground. Venu gate will desigend by fresh flowers and fabrics. An Altar will set at enterance of Venue of Mehndi ceremony and decorated with fresh flowers. 10 columns will set at bridal walk path and flower arrangamnents. at walkway 10 Lake Bistro tables will set and covered with colorful table cloth and bow with pink and fuchia chiffon fabrics and decorated with fresh flowers in vases. decorate specially with fresh flowers. Round and long tables will set for guests. Colourfull satin fabrics will use as tablecloth. Golden colour underplates will set on table. Napkin bracelet will set for each napkins and each one of the napkin will tie with ribbons which will set in the same colour of table clothes. Fresh flowers arrangements will set in accessories of the table. Candles will use for decoration. Red, Fuchsia, White, Green and Orange colour cloths chairs will set for Tıffany white chairs. 30 triple white leather seat will set with 15 white coffe tables. Colourfull pillows will set on each seat. Fresh flower arrangements will set on coffee tables in accessories. 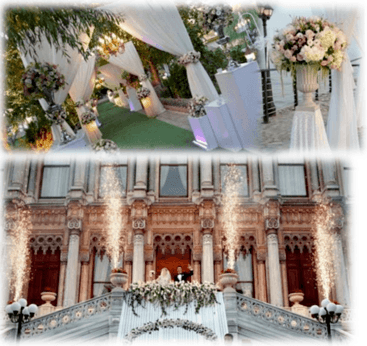 A candy bar will set at green area of palace for guests and Decorated with same concept of decoration of venue and lanterns, and flowers will use for decoration of candy bar. Chocolate, Confectionery, Sweet snacks, Turkish delights will set in special glass accesories. Silver vases will designed by fowers, glasses will decorated by pearls, white rose and crystals. Open buffet Lunch At Green area of Chiragan palace– Alcoholic & Nonalcoholic beverage. A professional make-up specialist will come to the hotel for the bride for 24 hour permanency and for the face mask Fixler Spray will be used. Natural looking silk eyelashes will be fixed (Service for 1,5 hours). The Mehndi ceremony will be shot by 3 professional photographers. Between 2500 to 3500 photos in JPEG format will be taken. One glass of coctail will be served. At the ballroom salon entrance, metal stand will be lighted with LED. The stands will set at bridal walk path and decorated with seasonal flowers. 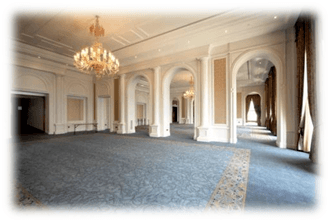 Venue (ballroom salon) will set for Sangeet ceremony. Stage will set and a Gazebo (Mandap) for Bride and Groom will prepared. Stage will decorate with fuchsia colour chiffon fabrics and with fuschia, pink and orange flowers. Special seat for bride and groom will set onstage with matress and coffee tables. Robotic lights will light the stage from ground. Long and round tables will set. Pink satin table cloths will lay on tables. Runners will lay on tables. Yellow colour gilding glass vases will put on table and decorated with Fuchsia, pink and orange fresh seasonal flowers, Cubic Mirrors will set under vazes. Golden coloured suplas will put under dishes on table. Pearl napkin bracelets will use on duni napkins, Candle holders will use to decorate tables. Golden colour tiffany chairs will bow tie with Fuchsia and pink colour fabrıcs and tulles. The stage will be prepared for artists. Professional DJ, ound Sytem, DJ mixer, Ceiling square truss will be installed and robot lights will be set.for decor.The video will be broadcasted live on the 24 m2 squere LED screen. robot light show from the ground. (Indian music). You can bring CD with Indian music you’d like to be played with yourself. A professional Hair dresser will wait at the Hotel If the hair needed to be redone after Mehndi ceremony or If the hair needs to be corrected. 3 english speakers wedding consultant Managers and 5 assistant hostesses to care with guests. AFTER PARTY-(24.00 – 03.00 o’clock)After party in the Enderun ballroom saloon of hotel. DJ, Sound System Dj mixer and robotic lights from ground. An available venue will set at saloon for Haldi Ceremony. Matresses and rugs will lay on ground. The groom will come to the wedding venue on a white horse, accompanied by 2 Dholak.The relatives of the groom will come to the place,where bride and her relatives will be waiting. Will be aerial video shooting with Drone. Bistro tables will be prepared and will be decorated with fabrics for guests who will watch the ceremony by standing. On the table will be vases with fresh flowers. Seating arrangement will set with wooden chairs and will decorate with colourfull tulles. Chairs on bridal walk path will decorate with flowers. After religios ceremony 2 white doves will be released by the couple as a symbol for luck. Professional dj and dj setup. Sound system and michrophone will set. In the garden of the hotel the venue will be prepared for wedding ceremony. Bridal table willbe set up on the stage. Behind the table one panel will be set up and decorating by colourful flowers. in front of the table, glass vases will decorated by special design with flowers and candles.Stage will be lightened with colored projectors light. Board will be prepared behind of table with Chiffon drapes. The Bridal table will be prepared special in colours of couple's dresses. Runners will be laid on it. Table will be decorated with flowers and other accessories. The mirrors will be placed on the table, the golden color glass vases will be decorated with flowers. Swarovski stoned under plates will be set up, the napkins will be tied with Swarovski stoned napkins bracelet. Swarovski stoned candles and candle holders also will be set up. The table will be decorated with Swarovski stoned mirrors too. Round, eclipsed, C shape and infinity sign shaped tables will be decorated and set up in the garden of the palace. The mirrors will be placed on the table, the golden colour glass vases will be decorated with flowers Under plates of gold color will be set up, the napkins will be tied with napkins bracelet. The table will be decorated with candles. Golden colured Tiffany chairs will be decorated with vibrant coloured tulles. Special designed 5-layer wedding cake- it will be decorated with fresh flowers and satin bow ties. plus 20 volcano fire- works show. The cake will be brought to the saloon on the special golden colored table on wheels. The stage will be prepared for musicians. Sound Sytem, DJ mixer, 6stands 40 m2 Ceiling square truss will be installed and robot lights will be set. for weddıng place robot light show from the ground and DJ (Indian music). You can bring CD with Indian music you’d like to be played with yourself. The video will be broadcasted live on the 24 m2 square LED screen. Special designed Bridal bouquet and the groom’s collar flower. A wristband of artificial flowers will be prepared for bridesmaids at the same color of bridal bouquet. Boutonnieres for groomsmen. Special garter with Swarovski stones for bride. Also garters at the same color will be prepared for bridesmaids. 3 exclusive professional photographers will take 2500 to 3500 pictures in JPEG format. Professional video recording with Jimmy Jip and 2 actual shoulder camera. The video regording from the air with drone. (A Wedding Story will be prepared. Original videos and photos taking in all ceremonies will be given in the hard disk. A professional make-up specialist will come to the hotel for the bride. so as for 24 hour permanency and for the face mask Fixler Spray will be used. Natural looking silk eyelashes will be fixed (Service for 1,5 hours). 4 Transfer and transportation of the staff/ team and necessary materials. A 5 minute firework show at the sea from the boat. Final firework show with 2 heart shaped fireworks. AFTER PARTY- (24.00 – 03.00 o’clock) After Party at the Enderun ballroom saloon of the hotel.DJ, Sound System, Dj mixer and robotic lights from ground.